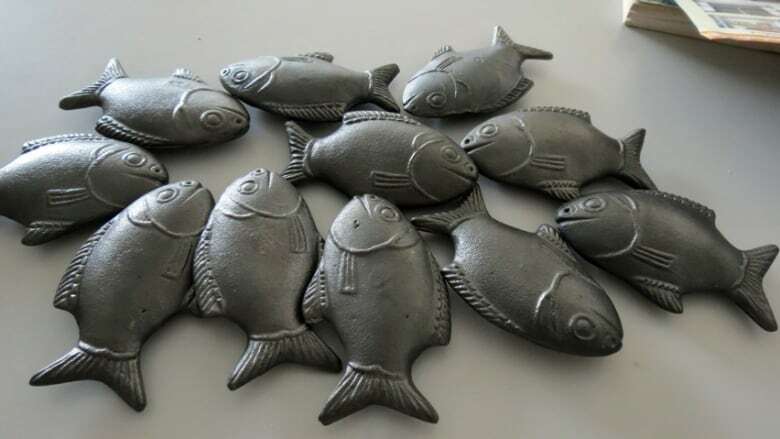 An "iron fish" in a cooking pot can provide 75 per cent of the recommended daily intake of iron when anemic mothers in Cambodia boil it with food, delegates were told at the maternal and child health summit in Toronto. The Lucky Iron Fish is a grassroots project from an Ontario-based company started by PhD student Chris Charles at the University of Guelph. "I was visiting Cambodia and saw first-hand the far-reaching effects of how anemia had crippled the country," says Charles, who developed the project as his PhD thesis and lived in Cambodia for almost five years during the initial studies and attempts to distribute the fish to villages. Iron-deficiency affects over 3.5 billion people. Cambodia has the highest rates of iron deficiency in the world, affecting 44 per cent of the population (more than 15 million people) and resulting in an estimated $70 billion of lost GDP. Symptoms of iron-deficiency can range from dizziness and fatigue to pregnancy problems, premature labour and developmental delay in children. The best sources of iron are meat and legumes. "People [in Cambodia] are eating on less than a dollar a day," says Charles, who is presenting the fish project at the Saving Every Woman, Every Child: Within Arm's Reach summit. "They don’t have the choice of eating more meat and because of side-effects of the pill, many prefer the disease to the supplements. There had to be a better way." It wasn’t an easy journey. The project originally started as an iron disk, and although the idea was good, the villagers weren’t that interested in using it in their cooking. Then the iron was offered in the shape of lotus leaf, but there was still little interest. Finally, Charles came up with the idea of shaping the iron like a fish native to Cambodia that is considered lucky. It worked. "You can have the best treatment in the world, but if you can’t figure out how to get people to use it, it’s useless," says Charles. Two separate clinical trials looking at iron levels in people's blood prior to their using the fish, at three months, six months, nine months showed an overall benefit. At 12 months, there was a 43 per cent reduction in anemia.Since citrus increases the absorption of iron, the results were better when the fish was combined with lemon juice. Dr. Stan Zlotkin, a nutritionist and pediatrician and chief of global child health at the Hospital for Sick Children in Toronto, says that the idea is promising. "I think more research has to be done to show that the iron that leaches from the Lucky Iron Fish is indeed absorbed," Zlotkin said. Charles says that it’s changed the lives of the women he sees using it. "I remember a woman coming to me and saying she was less dizzy, had more energy and sleeping better after using the fish. It was like we were reading a textbook of anemia and checking things off the list." The company was established in December 2012 and consists of a small group of dedicated employees in Canada. Two to be exact — Gavin Armstrong, the president and CEO, is a PhD student at the University of Guelph and a previous Fulbright Scholar, and Tania Framst, vice-president of operations. There are five other employees in Cambodia and members of an advisory board, including Charles, who is currently studying medicine at McMaster University in Hamilton. The Lucky Iron Fish Project is not a charitable company. Framst says that people are more likely to use it if they pay for it. "We try to sell it where we can, but otherwise give it away," says Framst. The making of the fish has also helped with local business, as a Cambodian family manufactures the fish locally from their home. The fish itself costs about $5 and lasts at least five years. In comparison, iron pills cost about $30 a year. The goal for 2014 is to sell 10,000 fish. Already this year, the company has a commitment from NGO partners for 11,000 fish. There are plans to launch sales of the fish in Canada using a special strategy. For every customer who pays $25 for the fish, the company will donate three fish to people in Cambodia. The Canadian government, a leader in its support for addressing the maternal health gap globally through the recent Muskoka Initiative, has supported this project with a $500,000 award through Grand Challenges Canada. In addition, the company has received over $1.1 million from private investors, who are present at the summit this week.